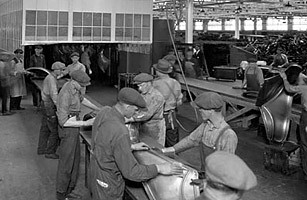 Men on the assembly line at a Ford factory in Chicago in 1926. No industrialist enjoyed upsetting the apple cart more than Henry Ford. In 1914 he announced that he would pay $5 a day to his workers, double the going rate. With the extra cash, Ford reasoned, they could purchase his Model Ts. The workers were becoming a bulwark of the middle class. Ford's next act came in September 1926, when the company announced the five-day workweek. As he noted in his company's Ford News in October, "Just as the eight-hour day opened our way to prosperity in America, so the five-day workweek will open our way to still greater prosperity ... It is high time to rid ourselves of the notion that leisure for workmen is either lost time or a class privilege." The five-day week, he figured, would encourage industrial workers to vacation and shop on Saturday. Before long, manufacturers all over the world followed his lead. "People who have more leisure must have more clothes," he argued. "They eat a greater variety of food. They require more transportation in vehicles." Taking advantage of his own wisdom, he discontinued the Model T and then, on a Saturday, launched the Model A. The 1927 unveiling would see 10,534,992 people visiting dealerships just to glimpse the latest product of the Sage of Dearborn.